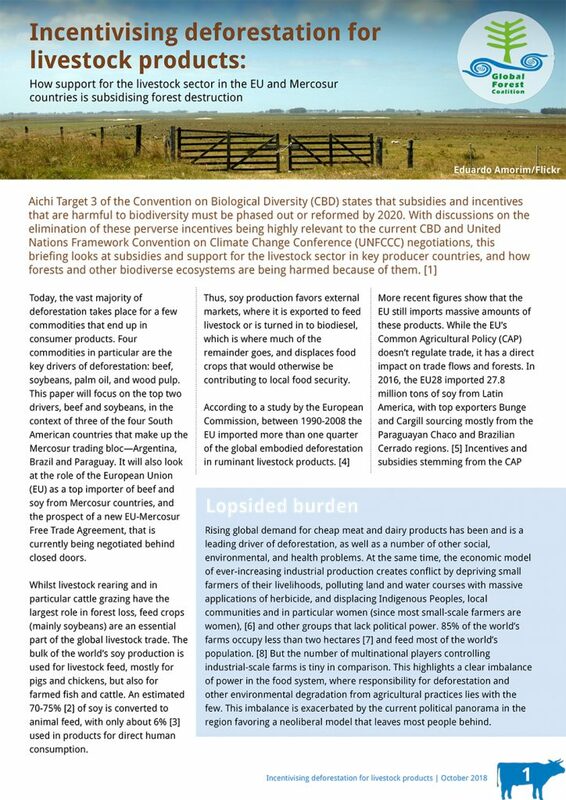 Aichi Target 3 of the Convention on Biological Diversity (CBD) states that subsidies and incentives that are harmful to biodiversity must be phased out or reformed by 2020. 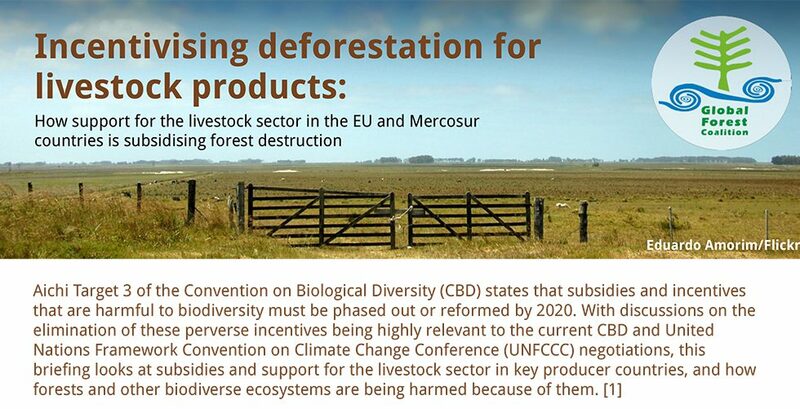 With discussions on the elimination of these perverse incentives being highly relevant to the current CBD and United Nations Framework Convention on Climate Change Conference (UNFCCC) negotiations, this briefing looks at subsidies and support for the livestock sector in key producer countries, and how forests and other biodiverse ecosystems are being harmed because of them. It also analyses the impacts of the EU-Mercosur Free Trade Agreement, which is currently being negotiated behind closed doors. The briefing concludes that there must be a major shift away from such extensive and intensive forms of livestock and feedstock farming, with the priority placed on a rapid reduction in meat and dairy consumption and overall dietary change towards primarily plant-based diets, as well as support for small-scale, localised food production. Protection of biodiversity, animal welfare and the rights and practices of peasant farmers, Indigenous Peoples and local communities should form the basis of agricultural policy.